Formal Scripts are great typefaces to suggest elegance, quality, refinement and luxury. They are used a lot in print publishing, but you don't see many formal scripts used on the web. Isn't it? Mostly because their tiny hairlines breaks and disappear when used at small sizes on the screen. Also, they usually have long ascenders and descenders, and the lowercase letters look too small when compared to most sans or serif fonts. More over, they are usually quite condensed, making them even more difficult to read. That's why we designed a script type specifically tailored for web use, that can survive being set even as small as 13px. Petit Formal Script font contains 426 defined characters and 320 unique glyphs. 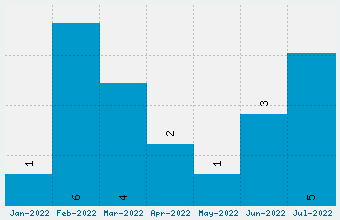 The font contains characters from the following unicode character ranges: Basic Latin (93), Latin-1 Supplement (96), Latin Extended-A (127), Latin Extended-B (27), IPA Extensions (1), Spacing Modifier Letters (9), Greek and Coptic (1), Latin Extended Additional (34), General Punctuation (16), Superscripts and Subscripts (7), Currency Symbols (1), Letterlike Symbols (1), Number Forms (2), Mathematical Operators (7), Private Use Area (1), Alphabetic Presentation Forms (2). 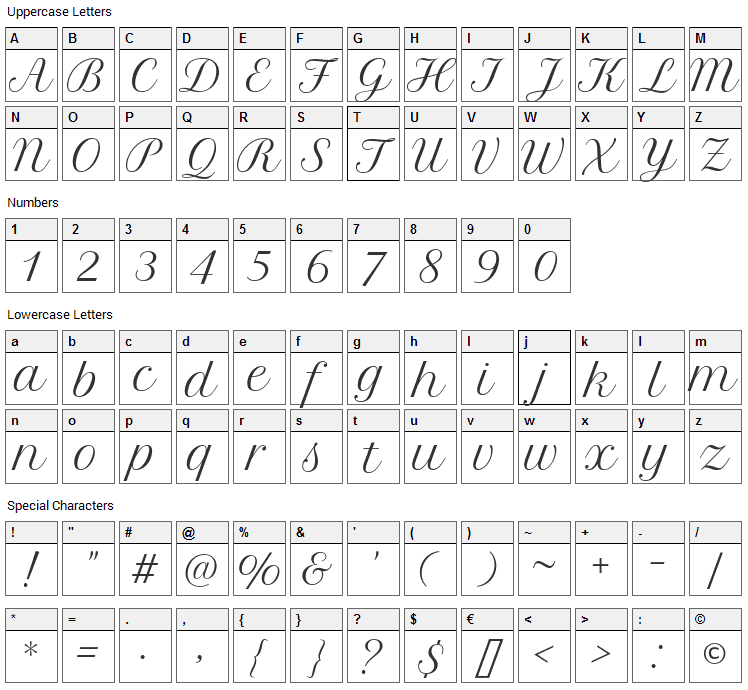 Petit Formal Script is a script, school font designed by Impallari Type. The font is licensed under SIL Open Font License. The font is free for both personel and commercial usages, modification and distribution. In doubt please refer to the readme file in the font package or contact the designer directly from plus.google.com. 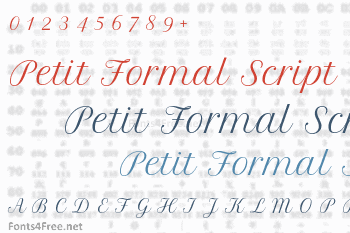 Petit Formal Script font has been rated 5.0 out of 5 points. A total of 1 votes cast and 0 users reviewed the font.